*(Via NBC News) – President Barack Obama said Tuesday night that he would put off a military strike and work with Russia, China and American allies to force Syria to hand over its chemical weapons. He said he would work with other countries to pressure Syria to put its chemical weapons under international control and ultimately destroy them — a proposal that reshaped both the crisis and the president’s address over two furious days of diplomacy. But Obama said he would order the military to stay in place in the region and to keep pressure on Bashar Assad, the Syrian leader, who the United States says ordered the attack against his opponents in Syria’s civil war. Speaking in a calm, direct, almost fatherly tone, Obama repeatedly invoked images of more than 400 children killed in the attack, launched by Assad’s against rebels in the two-year Syrian civil war. 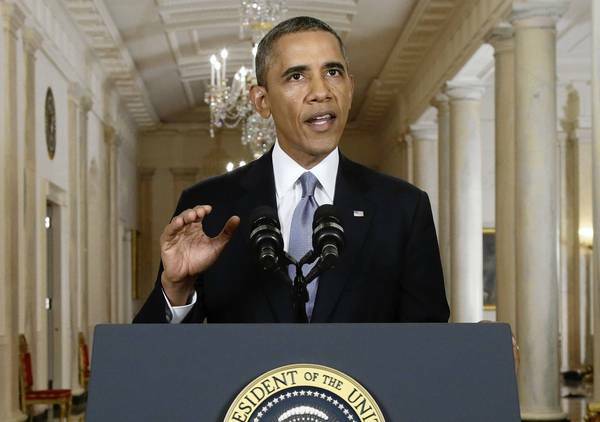 Read President Obama’s FULL address on Syria here. Previous ArticleDid Zoe Saldana Get Married to Boyfriend Marco on the Low? My President is not playing OK!!!!! I hope their is a soluion that does not involve the U.S. going into Syria however the Bog Cheif is not playing. At least he looked for another avenue and did not just lie to the contry and congress about weapons of mass destruction like GW with his lying azz. My President is still cleaning up that mess! You go Obama I love your swag!